St. Sproc or Sporoc, Daughter of Colum. Veneration was given, at the 30th of June, to Sproc, or Sporoc, daughter of Colum or Coluim, as we find inserted in the Martyrologies of Tallagh and of Donegal. St. Conuan, Bishop, of Tigh Collain, or Tigh Connain, in Cremhthanna, now Stackallan, County of Meath. In the Martyrology of Tallagh, a festival occurs, at the 29th of June, in honour of Conuan, Bishop, of Tigh Collain. The land of Ui-Crimhthainn comprises the present baronies of Upper and Lower Slane, in the county of Meath. It is thought to be highly probable, that the Four Masters are wrong, when they write the name of this place Teach Collain, as it is locally pronounced by the natives; and, it is supposed, the true form of the name had been Teach-Conain, "Conan's house." This house of Collan or Connan—now known as Stackallen—was situated nearly midway between Navan and Slane, in the county of Meath. It is curious to remark, that in some of those districts colonized by the Danes and English, the Teach or Tigh of the Irish was rendered into Sta or Sti, as in the present instance. Stackallen is a small village, in the barony of Upper Slane, and county of Meath. After the Anglo- Norman Invasion, Stackallen became a parish church, and it formed a small parish, in the diocese of Meath. Under the head of Teach-Connain, Duald Mac Firbis enters Connan, bishop, from Tech Connain, in Crimthann, at June 29th. Again, in the Martyrology of Donegal, at the same date, he is registered as Cenuan, Bishop, of Tigh Conuain, in Cremhthanna. At the 28th of June, we find set down in the Martyrology of Tallagh, a festival in honour of Ernine, Cluain-find. There is a Clonfane, a townland in the parish of Kinawley, barony of Knockninny, and county of Fermanagh; and another town land similarly named, in the parish of Moymet, barony of Upper Navan, and county of Meath. There is a Clonfinane, in the parish of Loughkeen, barony of Lower Ormond, and county of Tipperary. There is a Clonfinlogh parish, in the barony of Clanwilliam, in the same county. There is a Clonfinlough, in the parish of Clonmacnoise, barony of Garrycastle, and King's County. There is a Clonfinnan, in the parish of Dulane, barony of Upper Kells, and county of Meath. There is a Cloonfin in the parish of Granard, barony of Granard, and county of Longford. There is also a Cloonfineen in the parish of Kiltullagh, barony of Castlerea, and county of Roscommon. There is a Cloonfinlough, in a parish of the same name, barony and county of Roscommon. There is a Cloonfinnan, in the parish and barony of Mohill, county of Letrim. Again, there is a Cloonfinnaun in the parish of Kilconduff, barony of Gallen, and county of Mayo. These are the only townland names in Ireland, that may be suspected to be identical in etymology with the place here named, and which does not as yet appear to have been identified. In the Martyrology of Donegal at the 28th of June, the feast of St. Ernin of Cloonfinn is found. The Martyrology of Tallagh registers the name of Aedha, at the 27th of June. In the copy of an Irish Calendar, now preserved in the Royal Irish Academy's Library, he is called St Aodh, the Fair, or White, son to Lugack. He is alluded to by Father John Colgan, as St. Aidus, Confessor, placed at the 27th of June, in the list of Irish Festivals. In the Martyrology of Donegal at this date, we have the entry of Aedh. St. Colman, Son to Roi of the Refectory, and over Lambay Island Church, County Dublin. The name of Colman Partraighi appears in the Martyrology of Tallagh, at the 26th of June. This appears to be the St. Colman, son of Roi, belonging to Reachrainn, according to Marianus O'Gorman, who enters him in the Calendar at this date. He is said to have been that deacon, placed by St Columkille, over the church founded by him in Reachrann, now Lambay Island, off the County Dublin coast. He flourished, about the middle of the sixth century. At the same date, in the Martyrology of Donegal, his name occurs as Colman Proinntighe, or of the refectory. In a Manuscript Calendar of Professor Eugene O'Curry, at this same date, he is entered simply, St. Colman. ST. THIU, PATRON OF RUBHA, DIOCESE OF DOWN. THE festival of St. Thiu or Tiu, of Rubha, is celebrated, on the 24th of June, according to the Martyrology of Donegal. This female saint's name does not appear in the earliest Irish Calendars; so, it is probable, she flourished after the eighth century. She belonged, it is said, to the posterity of Eochaidh, son to Muiredh, who descended from the race of Heremon. We are informed, likewise, that Rubha was the name of this holy woman's place, and that in Ard Uladh it was situated. Some doubt existed, regarding the modern denomination of Rubha. A learned writer inclines to the opinion, that it is identical with the townland of Echlinville, in Ballyhalbert parish, otherwise St. Andrews, barony of Upper Ards, and called at present Row or Grange-Row, but formerly Rowbane or Rheubane. The adjoining townland is still called Rowreagh. In the year 1306, we find a chapel, named Grangia, on the townland of Gransha, parish of Inishargy, and barony of Upper Ards, in the county of Down. The townland of Gransha, at the south end of Inishargy parish, is bounded southwardly by the River Blackstaffe, which was formerly regarded as a line of demarcation, between the Great and Little Ards. About a mile eastward of this townland, the other chapel, called Row or Grange Row, stood. This seems to have been the place, anciently called Ruba, and Anglicized Rue or Rubha. Before the middle of the last century, the name of Rheubane was changed by James Echlin, Esq., who had a seat here, to Echlin-ville, which was called after himself as being the proprietor. The old chapel formerly stood at the entrance to Echlinville demesne; but, a single trace of its ruins cannot be seen at present. In the O'Clerys Calendar, Rubha is located, also, in the Ards of Ulster. ST MOCHAOI was born about 420 A.D.; founded the abbey of Oendruim (pronounced Endrim; i.e.,"the single ridge"), on the beautiful island bearing that name, about 450; and died in the year 496 or 497. For several centuries the abbey, in which education and monasticism were combined, occupied a prominent position, and from it emanated a number of subsequent founders of similar institutions. Between 974 and 1178 history is silent in regard to it; but it is certain that, from its position on Loch Cuan (Strangford), which was infested by Danish marauders, it came in for a large share of their devastating attentions. From its affiliation, in 1178, with an English religious establishment, it seems to have fallen into a condition of decay; and in 1450 it is simply noted as a parish church in the charge of the Bishop of Down. The island of Oendruim or, as it is now called, Mahee, from Inis Mochaoi, in memory of its patron saint and founder is situated most picturesquely on Strangford Lough, about seven miles from Comber, and is approachable on foot or car by a fine modern causeway, which crosses an intervening island. On the shore end of the island may be seen many remains of the stone buildings which superseded the original wooden structures in the history of this venerable, romantic, but popularly-neglected shrine. These remains include the stump of a round tower; traces of extensive foundations, once partially laid bare by the late Bishop Reeves, and now almost entirely hidden from sight again; the site of the harbour, where anchored "ships" from Britain; evidences of a God's-acre, hallowed by long time and association ; and a fairly complete castle of a later period. The circuit of the island can be made on foot leisurely in a couple of hours, and the walk affords a view of the extensive waters of the once Dane-infested lough, the distant hoary walls of Greyabbey, the haunts of Saint Patrick, the scene of the death of Ollamh Fodhla, and the daring and unscrupulous deeds of De Courcy, and many other places of interest. Baile Draigin (Ballydrain) about half-way between Comber and Mahee Island is so called from baile, a place, and Draigin, a blackthorn tree; and the reader will observe the connection between this place and the story. No trace of a church, however, has yet been discovered at Ballydrain. Rudraide (pronounced Rury) is the modern Dundrum Bay. The idea contained in the following verses has been variously rendered by several eminent authors. The incident in which it is here embodied may, however, be fairly claimed as the oldest version the original in fact. And His cause from all disaster." In a thorn beside him. Of this gracious word the meaning." From an angel's silvern throat." Mortals, sought the heavenly plain. Broad, and not a hand's-breadth older. Since the bird had spoken. Toward his island church he bore it. And " To Saint Mochaoi "writ o'er it. "Now," quoth he, "in truth I'm dreaming. 'Neath the Abbot's searching eyes. Ulster Journal of Archaeology, Vol 10 (1904), 100-103. St. Crunnmael, Son of Ronan, of Berrech. According to the Martyrology of Tallagh, at the 22nd of June, there was a festival for Crunmaeil mic Ronain. The Calendar of the O'Clerys states, likewise, that he was of Berrech. There is a parish, called Kilberry, in the barony of Narragh and Rheban West, in the county of Kildare. It borders along the River Barrow, lying about two and a-halt miles northwards from the town of Athy. A burial-ground now enclosed, within which interments yet take place is there, on the east bank of the River Barrow. The foundations of a very old church are in it, but scarcely traceable; for, they are overgrown with sloe-thorns, hawthorn bushes, briers, and old trees. The reed-grown course of the River Barrow passes by, and its bank formerly had been the western boundary of the graveyard, before it was enclosed by a rather modern stone wall. 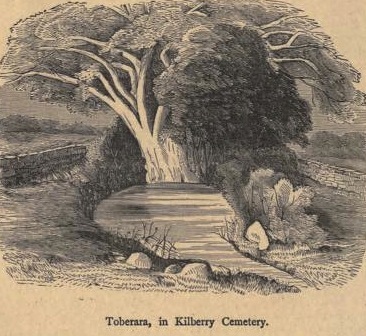 Near the old cemetery, there is a celebrated well, called Tobbera, or Toberara. This beautiful and clear stream rushes with great force from beneath the roots of a very ancient ash tree, where it forms a broad yet shallow pool. Thence it issues, in a devious but short and rapid course, until it Renters the Barrow. On the verge of this river, and on a bank somewhat elevated, Toberara finds its source. It is incorrectly stated, to have been dedicated to St. John. The writer was informed, by an old inhabitant, living in the vicinity, that a patron had been formerly held there, and always on the 22nd of June; but, this practice has been discontinued, since the year 1840. It should be a curious subject for enquiry to ascertain if this Kilberry could have been a comparatively modern denomination, derived from Berrech and Kill "church," as connected with St. Crunnmael. The circumstances of the local patron having been formerly held, on the 22nd of June, at least lends some degree of credibility to such a supposition. In Mrs. St. John's Poem "Ellauna," allusion is made to a pretty little island, named Teigh Berara, midway between Reban and Athy. We are told, there was a well sacred to St. John, at that place; and in the early part of this century, the ferryman on the River Barrow is stated to have had many pilgrims going across to perform pilgrimages there, on each Midsummer Day, June 24th. In Kilberry, the ruins of two castles, which appear to have been remarkably strong in mediaeval times, yet remain; and those were intended to guard the English pale, on that side of the River Barrow. In the same parish of Kilberry, there is also another graveyard; but apparently, less ancient than the former, although nodoubt of very considerable antiquity. That unenclosed graveyard was much frequented for interments.The extensive ruins of an old church, with very thick well built walls, and mantled over with large clusters of ivy, may be seen within a large meadow-field, and near a high road, not very far from the River Barrow. A tall and square tower rises near the old church, and adjoining the east gable. Both the eastern and western gables of the church are yet very perfect. The graves—as observable in many ancient Irish churchyards —mostly lie on the south side of the burial-ground. The walls of the old building are now greatly delapidated. There are various fragments, apparently of old monastic buildings, and those also of considerable apparent solidity and importance, not far removed from the graveyard. An old castle rises on the other side of the road. Very fertile and improved land is near this site. Towards the north and west, the Killone and Stradbally hills, in the Queen's County, appear to great advantage, from a scenic point of view. According to the Martyrology of Donegal, veneration was given, at the 22nd of June, to Crunnmael, son of Ronan. Under the head of Tamlacht, Duald Mac Firbis enters a Cronmael, abbot of Beg-Eri, as also bishop and lector of Tamlacht. He was drowned A.D. 964, at Tochar Eachdhach. It seems probable, however, that he was not identical with the present saint. St. Diarmaid, Bishop of Castledermot, County of Kildare. There can hardly be a doubt, that the present saint flourished in the earliest ages of Christianity in our country. In the "Feilire" of St. Aengus, the name of this holy man is given as Ainle, which the commentator makes synonymous with Diarmait of Disert Diarmata Ui Aeda Roin. The former appellation is interpreted in English, "delightful his colour." We find the name Diarmait and Disurt registered in the Martyrology of Tallagh, at the 21st of June. More circumstantial are the following details. He belonged to the race of Fiatach Finn, monarch of Erin. In the Book of Lecan, the genealogy of Diarmaid of Disert Diarmada is given, up to Muiredach Muinderg. It need scarcely be observed, that Disert Dearmada is the present Castledermot, in the baronies of Kilkea and Moone, county of Kildare. Besides St. Aengus the Culdee, the Martyrology of Marianus O'Gorman and the Calendar of Cashel, also, commemorate St. Diarmit, at the 21st of June. While he is styled abbot of Castledermot, this saint is called bishop, in the Irish Calendars. He is said to have been founder of a monastery at Castledermot, about the year 500. The first name of this place was Diseart Diarmuda, afterwards called Tristledermot, and at present it is known as Castledermot. The name has thus been derived from the present saint. There are several ancient remains about here, among the principal of which are, a Round Tower, which is now used as a belfry to the Protestant church, with which it communicates, and beside which it stands, on the left angle of its gable, as you enter the church door. There is an ancient stone cross, which is perfect, and it stands on a pedestal, within a few yards of the Round Tower. The shaft of another cross lies south-west from the church; the arms of this cross, being broken off, are placed beside the shaft as the head-stone to a grave. Likewise, there is an ancient archway, that spans an entrance into the church. This is thought to have been a portion of the old monastery. This archway is near the pedestal of that cross, which has been last mentioned. 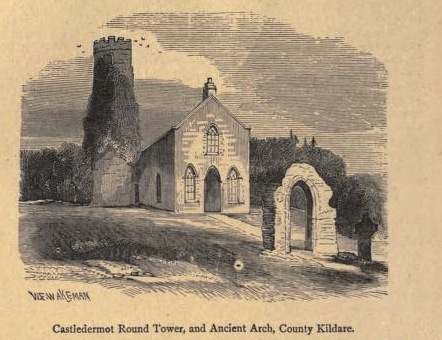 Other interesting ruins of mediaeval religious houses are yet to be seen in Castledermot. The Martyrology of Donegal, records him as Diarmaid, grandson of Aedh Roin, Bishop of Disert Diarmada, in Leinster. Likewise, under the heading of Disert Diarmada, Duald Mac Firbis records Diarmuid—descendant of Aedh Ron—a bishop of Disert-Diarmada, in Hy-Muiredhaigh, at June 21st. Little more seems to be known, concerning this holy founder of an establishment and of a town, both of which are celebrated in our ecclesiastical Annals. St. Guibhsech, of Cluain-boirenn, now Cloonburren, County of Roscommon. Veneration was given on this day to Guibhsech, of Cluain-boirenn, as we find registered in the Martyrology of Donegal. Her place is now called Cloonburren, in the parish of Moore, and near the Shannon, in the barony of Moycarn, and county of Roscommon. St. Cairech Dergain [feastday February 9] was patroness of this church. A nunnery seems to have existed here from a remote period. The deaths of some of its Abbesses are found recorded in our Annals. St. Coelain or Caolan, of Doire Choelaine. On the 19th of June, we read in the Martyrology of Tallagh, that Coelain, of Doire Choelaine, was venerated. Derrycullion is the only Irish townland we find, nearly resembling the foregoing ancient denomination. It is situated in the parish of Aghalurcher, barony of Magherastephana, and county of Fermanagh. The Martyrology of Donegal, at this same date, merely records Caolán, of Doire. In the table, subjoined to this Martyrology, his name has been rendered into the Latinized form, Caelianus. ARTICLE I.—ST. FURADHRAN OR FURODRAIN, ABBOT OF LANN-LEIRE, NOW DUNLEER, COUNTY OF LOUTH. SIMPLY the name, Furodrain, occurs in the Martyrology of Tallagh, at the 18th of June. According to the Calendar of the O'Clerys, he belonged to the race of Colla Dachrioch. In the Festilogy of St. Aengus, at the 18th of June, his feast is commemorated. On this notice, there is an Irish comment, which states, that Boethin and Furodran were two sons of Moenan of Lann Luachain, in Bregia. The place of this saint had been identified with the old church of Lynn, on the east side of the beautiful Lough Ennell, in the barony of Fartullagh, and county of Westmeath. So early as the beginning of the eighth century, an abbey seems to have been existing in this locality. It seems, however, that his place must be sought for, within the former territory of Feara-Arda-Cianachta, so called from the race of Cian. The Rev. Dr. Reeves has identified the ancient Lann-Leire with Dunleer, in the barony of Ferrard, and in the county of Louth. This seems to be the true conjecture. The Welch or old British term Lann is usually found, to be the equivalent for a church; and, according to a statement sent forth, Lann Leire has been interpreted the "Church of Austerity." We find bishops presiding at Lann Lere, from the middle to the close of the ninth century....In the year 921, the district of Feara Arda, and also Lann Leire, and Fearna Rois, were plundered by the foreigners. At this day, the Martyrology of Donegal registers our saint as Furadhran, Abbot of Lann-Leire. He is called likewise the son of Maonán. Article II.—St. Baithin or Baothan, of Lann-Leire, now Dunleer, County of Louth. Father John Colgan alludes to St. Baithin, as having been venerated, at the 18th of June, according to our Irish Calendars. The Martyrology of Donegal records him, likewise, and at the same date, as Baothan, son of Maonan. To the foregoing notice, the word (Juvencus), within brackets and Italicised, occurs after his name, as found in the Table to this Martyrology. The Irish Calendar, preserved in the Royal Irish Academy, enters him, at the xiv. of the July Kalends. Saint Enolichus, June 17 - a case of mistaken identity? Reputed Feast of a St. Enolichus. In a Manuscript Florarius is set down the feast of St. Enolich, Confessor in Hibernia, at the 17th of June. Nothing more regarding him—under such a suppositious name —seems to have transpired; but, as we have already shown, in the First Article at this date, Enolichus was only a mispelling of Molingus' name, as found in the printed copy of Usuard. Wherefore, in Greven's additions to Usuard, the foregoing account is given, and it has been copied, by succeeding writers. Canisius and Ferrarius have similar entries. At the 17th of June, Father Henry Fitzsimons, and the anonymous Calendar, published by O'Sullevan Beare, set down a feast for St. Enolichus. The Bollandists enter his assumed festival, also, at the same date. ST. CETHIG, OR CETHACH, BISHOP OF CILL GARADH, OR ORAN, COUNTY OF ROSCOMMON, AND OF DOMHNACH SAIRIGH, IN CIANACHTA, COUNTY OF MEATH. THE fame of a great master naturally overshadows that of his less distinguished disciples. To this cause is mainly owing, perhaps, the few indications we now have of many worthy labourers in our early church. This Cethecus, however, is well known in the Irish Calendars, and he is said to have lived contemporaneously with our celebrated Irish Apostle, St. Patrick, by whom it seems probable he was baptized. He was born most likely, in the early part of the fifth century. Thus, in Tirechan's list of St. Patrick's disciples, we meet with Cethecus or Cethiacus. On the 16th of June, in the Martyrology of Tallagh, we find the simple entry, Cethig, Bishop of St. Patrick. In like manner, Marianus O'Gorman treats of him. According to received accounts, his father was a Meath man, from Domnach-Sarige, near Duleek. He is said to have been of the race called Say, who lived in the territory of Cianachta, in Magh-Breagh, of Meath. This, too, comprised Domhnach Sairighe, which must have been near Duleek, the old name for which was Damhliag-Chianain. His mother was of a Tirellil family. He was born, too, in that part of the country. This is now a barony, in the county of Sligo, and originally it signified the territory or land of Oilell. Cethach is classed as one of St. Patrick's disciples. The Irish Apostle is said to have selected Cetchen, when he had come into the territory ot Hua-Noella, where, in a place called Domhacha, he erected a church called Sencheall Damhaighe, in which he left Cetchen, as also other disciples. Colgan thought that Ceihemis was the same as Cethecus. This conjecture, however, is clearly inadmissible. They are mentioned distinctly, in the Tripartite Life, and the former is not called a bishop. They are distinguished also in Tirechan's list one by the name of Cetennus, and the other by that of Cethiacus. The latter is called Patrick's bishop, that is, suffragan of St. Patrick. He is said to have been employed as bishop, and in various places far distant from each other. Thus, he officiated at Domnach Sarige, in his father's country, as also at a place called Ath-da-Laarg, in his maternal and natal country. On Easter Sunday, Cethecus was at Domnach-Sarige, and at other times, especially on Dominica in Albis, he officiated in Tirellil. In this statement, there is nothing improbable. Cethecus could not have been a bishop probably before a.d. 440. But, it is very natural to suppose, that St. Patrick wanted the assistance of some bishops, unattached to any fixed Sees, that they might ordain priests and attend to other episcopal duties, when he could not conveniently act in their distant places. It has been stated, that St. Patrick visited Hy-Many, a district, partly in Roscommon, but chiefly in Galway. While St. Patrick was in Connaught, he founded a church, at a place afterwards called Kill-Garadh, otherwise Huaran-Garadh, now Gran, owing to the circumstance of his having produced from the earth a cold and bubbling spring well. Here it was destined, that one of a band of brothers from France, and who were disciples of St. Patrick, should remain. While hearing about the progress made by their countrymen in Ireland, and considering the unhappy state of disturbance prevailing in many parts of Gaul, in those times, it is not to be wondered at, if some persons from that country might have come over to our island, as to a place of greater peace and security. In the Litany of Aengus, invocations of Gaelic saints, whose remains were in various parts of Ireland, are to be found. It is more probable, however, that the greatest part of these pilgrims did not come over to Ireland, until several years later than this period. Over the church of Cill Garadh, a St. Cethogus or Cethecus is said to have presided, in the fifth century; but, for this statement, we do not seem to have very satisfactory evidence. One of the Irish round towers yet remains at Oran, a parish in the barony of Ballymoe, and county of Roscommon. It is only asserted, that Cethecus was buried in Kill-garadh, or Oran. But, it does not thence follow, that he was bishop of Oran, as Archdall says. It would appear, there was a place bearing this name, in the territory of Hy-Many, which embraced a great part of the southern and eastern part of the county of Galway. There was also a Cill Garadh in Scotland. Oran was nothing more than a parish church, and should not have been placed among the Irish monasteries. The date for this holy bishop's death is not known. Bishop Cethechus is said to have been buried in the parish church of Kill-garadh, or Oran, and there his relics were afterwards preserved. To it, many pilgrimages continued to be made, down to the close of the last century. The name of this holy man appears, also, in the Martyrology of Donegal at the same date, as Cethach, Patrick's Bishop, of Cill Garadh, in the territory of Ui Maine, and of Domhnach Sairighe in Cianachta, at Daimhliac Cianan. He was, it is said, of the Cianachta. The Life of Patrick is quoted, as authority for the foregoing statements. Under the head of Domhnach Sairighe, Duald Mac Firbis enters Cethach, bishop, at June 16th; and, at the same date, under the head of Daimhlaig, Duald Mac Firbis again enters, Cethech, bishop, from Domnach-Sairighe, at Daimhlaig Cianain. More than the foregoing we cannot discover, in reference to this primitive bishop. St. Colman, Son of Corodran, of Meelick, County of Monaghan. In the Martyrology of Tallagh, there is an entry, Colman Mac Corardain o Imleach Brean. The place and festival of this saint at Imlech Brenn is noticed under the parish of Emlagh or Imlagh, also called Imleach-Fia and Imlach-Beccain, in the barony of Lower Kells, and county of Meath.In the Martyrology of Donegal, we find St. Colman, son of Corodran, of Miliuc, in Dartrighe Coin-insi, was venerated at the 15th of June. The Meelick, in which this saint's memory had been celebrated, may have been situated within the barony of Dartry, in the western part of Monaghan County. Its ancient denomination was Dartraighe Coininnsi, which is said to mean Dartrey of the Dog's Island, and it now forms the barony of Dartery, in county of Monaghan. 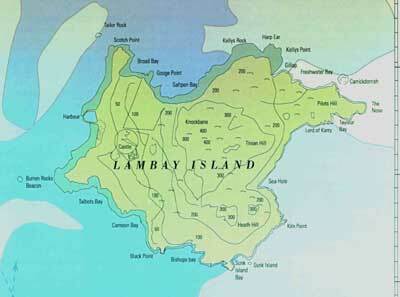 Yet, his place has been assigned to that part of Clones parish, which lies within the county of Fermanagh. St. Ciaran, of Bealach-duin, now Castle-Kieran, County of Meath. In the Martyrology of Tallagh, at the 14th of June, the simple entry, Ciaran, of Bealaigh Duin, occurs. According to the Calendar of the O'Clerys, this Ciaran descended from the race of Irial, son to Conall Cearnach, who is of the race of Rudhraighe, and who belonged to the progeny of Ir, son to Milidh. He was born probably before or about the beginning of the eighth century. He is thought to have been one of the authors, who wrote the Life of St. Patrick. He is designated the Devout, and he is distinguished as abbot of Belach-duin. This etymon means in English, "the road" pass of the fort. This was the ancient name of Disert-Chiarain or Castlekieran, near Kells, in the county of Meath. In Irish, it is now corruptly called Ister-Chiarain. An old church, yet not founded by the present saint, but called after him, is there situated on the Abhainn-Sele, or Blackwater River. According to a popular rumour, the present saint was a stone-cutter. Many legends are current regarding him, in the neighbourhood where he lived, but hardly any of them are of a reliable character. The old church yet remains. It is quadrangular, measuring forty-five feet six inches, by twenty feet. Most of the stones have been carried away, and the whole presents a melancholy picture of desolation. The interesting remains of five Termon crosses were here, and between four of these the church is situated. They were placed north, south and west of the ruin. The base of one was erected in a ford of the River Blackwater; but, the shaft, arms and top were removed, many years ago. The ancient crosses at this church sufficiently indicate its antiquity. Around one of these, on the north side, and placed in the Blackwater, cattle used to be driven by the country people, who believed that practice should preserve them from distemper. About a furlong's length, towards the west of the old church and cemetery, one of the most beautiful of the Irish holy wells may be seen, and shaded by a hoary ash tree, of surpassingsize and beauty. It springs from a limerock of considerable extent, and it falls into a small natural basin, at the foot of the tree. This is called St. Kieran's Well. There is a well, dedicated to St. Kieran or Ciaran, also at the Downs, about 3 miles east of Mullingar, in the county of Westmeath. In a little mound above it, there is a sculptured stone, partially embedded in the earth, and with a rude effigy carved upon it. According to a local tradition, a church or monastery formerly was there, but not a vestige of it now remains. 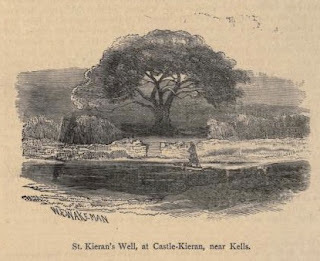 The well is walled into a square upright opening, and it is held in great reverence by the people; but, whether it was connected with the present St. Kieran, or another bearing the same name, is uncertain, as the patron's feast is not known. The death of our St. Ciaran, distinguished as the Pious, on the 14th of June, A.D. 770, or A.D. 778, is announced in the Annals of the Four Masters. The Martyrology of Donegal,at this same date, designates the saint as Ciaran of Bealach-duin. The Bollandists note St. Kieranus, Abbot of Belachduin, at 14th day of June, in their collection. A beautiful legend is current, that formerly the old bells of the church of St. Kieran used to be heard sounding at midnight, on every Christmas Eve. Those live, who assert, they have frequently heard them chime most distinctly. During the last century, the former parish priest of the place used to celebrate midnight Mass within the old ruined church; but, this practice has long been discontinued. While flocking to this Mass, "the miraculous bells" began to chime, and they only ceased at its commencement, according to popular tradition. St. Diucaill or Dichuill, of Achadh-na-cro. On the 12th of June, according to the Martyrologies of Tallagh, and of Donegal, veneration was given to Diucaill, or Dichuill, of Achadh-na-cró. This place has not been identified. ST. MAC TAIL, OF KILCULLEN, COUNTY OF KILDARE. MUCH obscurity of date and personality hovers over the memorials of the present early prelate of the primitive Irish Church. It would seem, according to the account of Rev. John Francis Shearman, there were no less than three bishops, and all denominated Mac Tail, while these are severally named in connexion with Kilcullen. Regarding these bishops— if such there were—we have little information, and that is exceedingly unreliable. The Bishop, established by St. Patrick in that See, is thought by some to have been Mac Tail, the son of Dorgan, great-grandson to Aengus Mac Nadfraich, King of Cashel, who was slain, A.D. 489, at Cellosnad, now Kellestown, county of Carlow; but, this chronology should hardly agree with an appointment made by the Apostle of Ireland, as in such case, he should have been bishop for an incredibly long period. Another Bishop of Kilcullen, according to some authorities, was Mac Tail, son of Eochaidh, son to Barr, regulus of Leix. The Bishop of Kilcullen, Mac Tail, venerated on this day, is otherwise called Eogan, son to Corcran. He is said to have been son of Monach, of the Hy Barrache race, and whose father was Oilill Mor, son of Braccan, son of Fiach, son to Dairre Barrach—founder of that family— and son to Cathair Mor, King of Leinster and monarch of Ireland, who was slain A.D. 177. The truth seems to be, that the genealogists have been astray, in compiling the pedigree of Mac Tail, Bishop of Kilcullen, nor do we find reason for supposing, that a second bearing that name ever lived there in the station of its Bishop. The eldest son of Cathair Mor is said to have been Ross Failghe, from whom descended the Ui Failghe; the second son being Dairre Barrach, founder of the Hy Bairrche tribe; while Cathair Mor had other sons, named Bresal Enechglais, Fergus Loscan, Fiach Baicheda, Crimthann, and Oilill Cetach. The sons of Dairre Barrach were Fiach, Muiredach Snithe and Eochaidh Guinech; while these are said to have settled in the country between the Slaney and the Barrow, whence they were expelled by the Hy Cinnselagh, when these grew into power. The people of the Cliu and of the Fothartha sided with the Hy Barrche, and many battles were waged between them in the fifth century. Some of the Hy Barrche were banished long before the death of Crimthan, in the year 484; while repeated acts of violence and injustice, inflicted on the family of Eochaidh Guinech, led to the murder of his own grandfather Crimthan. Because he took the wright's tal (adze). Until he took the ... ? Though he was chaste (and) was a cleric." Others state his proper name to have been Aengus, of Lughaidh's race. The O'Clerys have it, that he belonged to the race of Corc, son of Lughaidh, King of Munster. He is said, by these writers, also, to have been brother to Colman, of Cill Cleitighe. This latter place has been identified as Kilclief, where lived two brothers, Eogan and Niall, to Diochu, of Saul,and all were sons of Trichem, a chief of Uladh. Classed among the disciples of the great Irish Apostle, this saint Mactalius is thought to have been identical with the Maceleus, mentioned among the disciples of St. Patrick, as found in his Life, and cited by Ussher, and by Colgan. It is probable, that Mac Tail met St. Patrick in Ulster, where his branch of the Hy Barrche appear to have been located. Mac Tail was one of the artificers of St. Patrick, according to some old list of his household. One of the Patriarchs of our Irish Church, St. Iserninus, also called St. Fith or Id, and who is stated to have received orders with the Irish Apostle St. Patrick, afterwards devoted himself to the labours of the Irish mission. He is said to have preached in Ui-Briuin Cualann, and there to have founded Kilcullen. It has been thought, that St. Patrick first placed one of his earliest disciples, Issemin, or Iserninus, as bishop over Kilcullen where he continued in that charge, until about the year 460. We are told, that Sliabh Cuilinn was the ancient name of old Killcullen hill, having taken its denomination from a man named Cuilleann. There a monastery formerly stood, the church of which being called Cill Cuilinn, "Church of Cuilinn" gave name to the town, known as Old Kilcullen. The present holy man Mac Tail is called Bishop of Kilcullen, which is now a parish in the county of Kildare. He is supposed to have succeeded Isserninus or Fith at Kilcullen, after a.d. 460, when the latter went back to his first flock. We have an account of the "Maiden Coinengean,'' or as she is called Cuach, having been a pupil or daltha of Mac Tail of Cillcuillinn, and certain injurious reports were circulated regarding both master and pupil. Whether these reports were correct or otherwise cannot be ascertained; but, according to what appears to have been legendary, alone, the clergy of Leinster are said to have denounced Mac Tail. That parish has obtained its denomination from the circumstance of the parochial church being situated in the town of old Kilcullen. This denomination has been communicated, likewise, to a barony, co-extensive with the parish. A bridge was built over the River Liffey in 1319, by Maurice Jakis, a Canon belonging to the church of Kildare. This structure gave denomination to the town, which is now known as Kilcullen bridge. It was erected about a mile north-west of this latter place. That bridge, built at the period just mentioned, is said to have spanned the Liffey in a different place from where the present Kilcullen bridge at the town crosses it. The decay of Old Kilcullen may be traced to such circumstance, and now hardly a trace of the former town appears. Towards the close of the last century to the east of the Round Tower was the shaft of a cross comprised in a single stone ten feet high, and in a garden bounding the north of the churchyard was the pedestal of another cross. The shaft of the cross remained in the year 1837, but it exceeded ten feet in height, and the pedestal was then found lying in a small field to the north of the churchyard. About eleven yards to the northwest of the tower stood part of a stone cross, about four and a-half feet high, exhibiting on the side facing the tower the figure of an Abbot or of a Bishop holding in his left hand a crozier, with a single crook. It was evidently intended to represent a crozier of the primitive ages of Christianity in Ireland; and, in his right hand there was a hatchet with a short handle. To the right of this figure was shown a bell of the primitive angular form, and under it might be seen a human figure lying on one side, with its head under the hatchet. On all the other sides were various representations, and similar to those, which are seen on Irish crosses of the same kind. A pedestal, on which probably this cross originally stood, lay adjoining a headstone, which was a few yards distant from it towards the north-east. Beside this pedestal was a tombstone exhibiting the figure of a warrior clad in mail which tradition says, represents Rowley or Rowland Eustace. In the churchyard, there is an ancient Round Tower, not exceeding fifty feet in height, with four windows. It did not appear to have been higher in the last century, but a considerable portion of the top is now broken. That part containing the windows has long disappeared, while the structure has been reduced to the height of about 30 feet. This remaining part being in a tottering state has been supported by inserting into its openings small stones bound with cement. According to tradition, and to Archdall, Old Kilcullen was a large walled town with seven gates. This writer states, that one gate only remained in his time. This was ten feet wide, with a handsome arch; but this gate does not now remain. Tradition states, that it was pulled down when coaches began to run by that town, as it stood an obstacle at that spot, where the road now bends. Nothing seems to be known with certainty, regarding the exact term of St. Mac Tail's incumbency; although its commencement has been assigned to the latter half of the fifth century. The year 548 is said to have been that of his death, and the day was on June 11th. If such be the case, he seems to have ruled for a lengthened period over the See. It is said, that St. Mac Tail had been one of those victims to the Cronchonnuil or Cromchonnail or great plague, which desolated Ireland about that time. It is probable, he departed this life and was interred at Kilcullen. Here several bishops and abbots succeeded him, and it became a place of considerable importance, in after times. He died in the year 548, according to the Annals of the Four Masters, and those of Ulster. The Annals of Clonmacnoise place his death, however, at A.D. 550. The festival of Maic Thail the sainted is recorded at the 11th of June, in the "Feilire of St. Aengus". A festival is registered in the Martyrology of Tallagh, at the 11th of June, in honour of Mac Tail, Cille Cullinn. In the Martyrology of Donegal at the same date, we find him designated as Mac Tail (i.e., Aenghus), of Cill Cuilinn in Leinster. In the Irish Calendar prepared for the Irish Ordnance Survey, at the iii. of the Ides of June—corresponding with June 11th—we have an entry of his festival. St. Sanctan, or Santan, Bishop. Veneration was given on this day, 10th of June, to Sanctan or Santan, a bishop, as we find entered in the Martyrologies of Tallagh, and of Donegal. It has been conjectured that the present St. Sanctan may have been identical with a young man, who was rescued from captivity, by St. Fechin, Abbot of Fore. Another conjecture may be quite as correct, viz., that he was connected with Kilnasantan, near Bohernabreena, near the head waters of the River Dodder, county of Dublin. Kilnasantan was granted by Archbishop Comyn—who built and endowed St. Patrick's Cathedral, Dublin—to the College of St. Patrick, and confirmation of that grant was made by Pope Celestine III., in the year 1191. In 1231, Archbishop Luke, granted this church to St. Patrick's Cathedral, on demise of Andrew de Menavia, the holder of it as a prebend. In 1306, it was returned as wasted by the O'Tooles, and in 1326, the English sheriff describes it, as belonging to the manor of Tallagh, but "lying within the Irishry," therefore waste and unprofitable. During the border wars of the middle ages, the exercise of Divine service in it was rendered difficult to the English settlers. In the sixteenth century, it ceased to be a church for worship, a chapel having been erected at a place called by the Irish Templeogue, or "the new church." The old church of Kilnasantan is now a ruin; but it measured about 18 paces in length by 5 in breadth. Although built at a very early period, and in a sequestered spot, its walls exhibit no contemptible skill in masonry. Early in this century were rude and broken granite crosses on the piers of its entrance, a large broken font inside the gate, and some tombs of the last century, uniformly and grotesquely sculptured. In Hibernia; natalis sanctorum abbatorum Columbe et Boetheni successoris ejus. 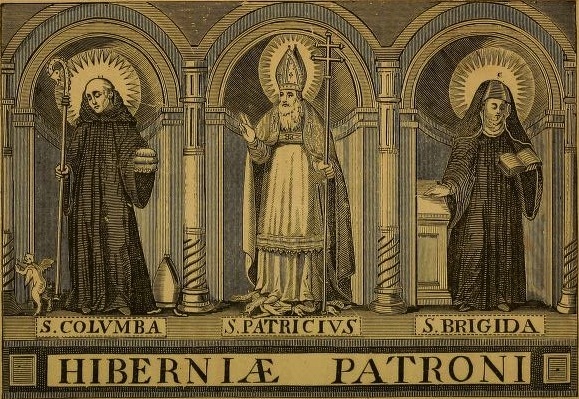 In Ireland; the natalis of the holy abbot Columba and of his successor Boethen. The immediate successor of the founder was his near relative and most particular favourite St. Baothin. There is a Latin Manuscript Vita S. Baithini preserved among the Archives of the Franciscan Convent, Dublin; also a Latin Manuscript Vita S. Baythini, at Bruxelles. There is also a fragment of an Irish Life of this saint, preserved in a Manuscript of Brother Michael O'Clery, and kept in the Burgundian Library, at Bruxelles. The Bollandists have given a Life of Saint Baithen, with a short preface, at the 9th day of June. This has been taken from a Salamancan Manuscript, which contained, likewise, the Acts of other Irish Saints. This holy man was nearly related to the great St. Columkille. They were the sons of two brothers, and consequently first cousins. Wherefore, St. Baithen or Baitheneus, also called Baithenus and Baithinus, was the son of Brendan, the son of Fergus, son to Conall Gulban. This latter was son to the celebrated Niall of the Nine Hostages. He was likewise called Comin Cominus. St. Baithen is said to have been born A.D. 536. From his very infancy, he was diligently instructed by the illustrious Abbot, who impressed on his tender mind the words of Divine Wisdom. He is distinguished, as being a dalta, or alumnus of St. Columkille. According to his Acts, from the time he was a child, Baothen had been educated by St. Columba. Under his holy discipline, he learned how to wage a perpetual war with idleness. As his years advanced, he grew stronger and more perfect, in the exercise of all good works. However, being a junior, by several years, he used to be always along with Colum Cille, because they were close in consanguinity and friendship, as they were thoroughly allied in the practice of holy works. Baithen was always either reading, or praying, or serving his neighbour. Sometimes, for the latter purpose, his devotions were occasionally interrupted. When he used to eat food, he was wont to say, "Deus in adjutorium meum intende," between every two morsels. His devotions were so continually practised, that even when he was travelling, or working, or eating, or conversing with any one, this holy man would still be communing with God, and under his tunic, his hands were often clasped in prayer, without any one present knowing it. When he gathered corn along with the monks, he held one hand up beseeching God, while another hand was gathering the corn, as we are informed by the O'Clerys; and the same account is contained in his Latin Acts, where we are informed, he would not brush away the troublesome midges from his face. In Ireland, Teach Baothin, now Taughboyne, in Cinel Conaill, or Donegal, is said to have been his chief church; but, whether he founded it, or lived there for any time, does not seem to be known. The transmission of the Iona abbacy in one family, and for ages after the time of St. Columba, is one of the most remarkable facts in connexion with his institute. The monks of old had no property in the church or monastery, however, but as servants and stewards to provide for its safe keeping. After the death of Colum Cille, from among the men of Erin the Abbot of Iona was chosen, and he was most frequently selected from among the men of Cinell Conaill, as the O'Clerys remark. Even the appointment seems to have vested in the one chief family of that province. According to this tribal custom, Baithen was now chosen, and St. Columba was immediately succeeded by him in the government of Hy, and consequently in the superintendence over the whole order or institution. According to some, Baoithin resigned his soul to Heaven, after three or four years of rule on the same day of the month, that Colum Cille went to Heaven. He departed this life in 595, according to the statement of some writers. It is supposed, by Archbishop Ussher and by Rev. Dr. Lanigan, that as immediate successor of St. Columba, his cousin St. Baoithen, survived him only for a year, neither more nor less, and that he died, A.D. 598. That the day was June the 9th— coinciding with the festival of the illustrious Columkille—is on record, and not doubted by any historical writer. Archbishop Ussher places the day of his departure on the "feria secunda," answering to Monday. He died A.D. 600 or 601, according to other authorities. He was interred at Iona, and most probably in the Relig Oran. His memory was venerated, both at Iona and at Teagh-Baithin, or Taughboyne, in Tir Enda, county of Donegal. He was reputed to be the founder of this latter church. From the bell of St. Baodain or Bothan, it is a common practice of the Donegal people to allow their herds to drink annually from the water of St. Bothan's river. The people too of that district admit the curative efficacy of quenching their thirst, with a draft of the river water, and taken from the bell. St. Luathrenna, or Luaithrenn, Virgin, of Kill Luathrenn, or Killurin, County of Sligo. ...The simple entry Luaitrind, Achaidh Coraind, occurs in the Martyrology of Tallagh, at the 8th of June. The Abbot St. Corbmac—who flourished in the sixth century—predicted the future sanctity of this virgin, according to an account, contained in his Life, as published by Colgan. To this we have elsewhere alluded. This pious woman descended from the race of Corbmac Gaileng, son to Tadhg, son of Cian, son to Oilioll Oluim, according to the compiler of the O'Clerys' Calendar. This also agrees with a statement of the "Sanctilogium Genealogicum." This virgin is said to have been the daughter of Colman, son to Falbe, son of Fennflatha, son to Daleus, son of Drona, son to Sualius, son of Fiden, son to Fidheurius, son of Artcherb, son to Fidchorb, son of Corb, son to Lugha —from whom the territory of Lugnia, in Connaught, has been named. In the Life of St. Corbmac, our holy virgin is called daughter of Falbe. But she was rather his granddaughter, as would appear from the foregoing genealogy. Her Acts seem to have perished, if they had ever been recorded; nor has her period been ascertained. The festival of this virgin was kept, on the 8th of June, in the Church of Kill Luathrenn, situated within that territory of Connaught, commonly called Corann. Tradition thus accounts for its name. A gentle and skilful harper, named Corann, received this territory as a free gift, on account of his musical and astrological accomplishments. The topographical tract, which is known as the Duinseanchus, has a legendary account of this district. It would seem, the present Killuran, must be sought for, in the old territory of Corann. According to Dr. O'Donovan, this is now the name of a barony, in the county of Sligo. Within the same county, and in the adjoining barony of Leyny, lies the parish of Killoran. There can hardly be a doubt, but that its denomination has been derived from the present St. Luaithrenn, and probably to her it was specially dedicated. However, there is an old church of this parish in ruins, but the patron is not remembered. It stood in the townland of Killoran North, and near a Lough so called. To a large extent, the surface of this parish is boggy and mountainous; but, owing to drainage, within the present century, the soil has been considerably improved. According to the Martyrology of Donegal, we find, that on this day was venerated, Luaithrenn, Virgin, of Cill Luaithrenn, in Coraun of Connacht. Not far from the episcopal city of Dromore, flow the lazy deep waters of the River Lagan, and often the Patron Saint, Bishop Colman, rambled along its banks in prayer and meditation. Indeed, if tradition speak the truth, often he passed over it with dry feet. But, it was well known, a great water monster lurked beneath its surface, always in quest of prey. Notwithstanding the danger of approaching him, yet, an incautious and innocent young damsel went down the bank, and stood upon some stepping-stones to beetle her linen. 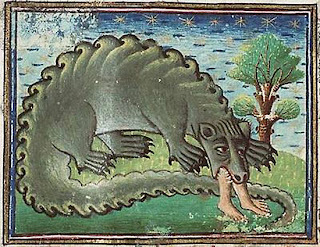 The wily monster sailed slowly towards her, and before she was aware of his approach, he suddenly reared his huge head from the deep, opened his tremendous jaws, and at one gulp swallowed the poor maiden alive. Although her terror was very great, yet she had presence of mind to call out, "Oh, holy Colman, save me!" Her cry was heard by the saint, and he prayed to Heaven for her release. Some of the girl's companions who stood on the bank, and who witnessed that fearful doom, set up shouts and screams. But St. Colman approached the river, and commanded the infernal beast to deliver up his prey. Then the girl he had swallowed was cast unharmed on the bank. There, to this very day, are shown the tracks of the holy bishop's feet, and that path down to the Lagan is called "St. Colman's road." The monster of the deep was afterwards banished far off, and to the shores of the Red Sea; but whether he survives in the shape of a modern crocodile—they are said to live for centuries—and sheds tears for his past delinquencies, or whether he has been long buried in the sands of Egypt, must furnish matter for further inquiry, as history and tradition are alike silent on the subject. 'Lageniensis', Irish Local Legends, No. VIII, The Water Monster (Dublin, 1896), 26-27. St. Maelaithghen of Tech Maeilaithghin, Probably in Cairpre Ua-Ciardha, now Barony of Carbury, and County of Kildare, or in Meath. The Martyrology of Tallagh merely registers the name Maelathgean, at the 6th of June. That Moelaithgen lived at an early period is proved, from the fact of his feast having been inserted in the Feilire of St. Aengus, at this date. The commentator has a note, to identify his locality. [The Irish note is thus translated, by Whitley Stokes, LL.D: "i.e. of Tech Moelaithgin in Cairpre Hua-Ciardai. Or in Mag Locha in the west of Bregia".] According to the Martyrology of Donegal, on this day was venerated Maelaithghen, said to have been of Tigh Maelaithghen, in Cairbre-Ua-Ciardha, or in Maghlacha, in the west of Bregia. This territory extended from the River Liffey to the River Boyne, and it took in a great part of the present county of Meath. The place of this saint must be sought for, within the ancient territory of Cairbre-Ui-Chiardha. This now forms the barony of Carbury, in the north-western part of the present county of Kildare. In Scotland, this Natalis of the Holy Confessor Maelaithchen was commemorated, on the 6th of June, as noticed in the Kalendar of Drummond.